Nothing in Mr. Cleveland's career was more remarkable than his conduct during the four years that he lived as a private citizen in New York between his two Presidential terms. Not the least exceptional circumstance in his career, by the way, was the fact that he was the only man elected to separated Presidential terms. He was, during this entire interval of four years, the principal figure in his party, though not its active leader. The party, in fact, had no acknowledged leader; yet all through these years the general public had no doubt as to the fact that he was the party's most notable figure. I saw a great deal of him during this time, in New York, at Marion, and in journeys and visits here and there. The absence from his house of politicians was exceptional and noteworthy. He kept in touch with the people by means of a large correspondence carried on with committee-men of little clubs in various parts of the country, and with other politically sympathetic persons. This correspondence was not of his initiation. Whenever he thought a letter-writer was sincere, he would answer him, — always with his own hand, — and without keeping copies of his letters. I thought this rash, and wondered that no harm came of it. I remonstrated with him on the subject, but he said that any one would have to produce the letter itself, if claim should be made that he had written this or that; so he did not bother about it. He felt that he was sowing the seed of honest, and, what he called, "genuine Democracy" by this correspondence, and his habit in this respect had its effect upon future events. During these four years he was practicing law in New York. Of course old associates and visitors from out of town would drop in sometimes at his down-town office; but they seldom followed him up during his evening hours. He greatly prized the quiet and privacy of his home, after so many years of public service. Here he was, living in the city in which existed the largest and most thoroughly disciplined political machine in his party, the strongest political organization in the country. A "logical candidate" might easily have permitted himself to cultivate some sort of "pleasant relations" with the leaders of the machine. But nothing of the kind was going on. Neither was there any attempt to manipulate "powerful leaders" or machine influences in other sections. His desire seemed to be not to "pull wires," but to act upon public opinion by occasional addresses, and, as I have said, by sympathetic responses to letters received from right-minded men all over the land, not in his own interest, but in the interest of the principles in which he believed. 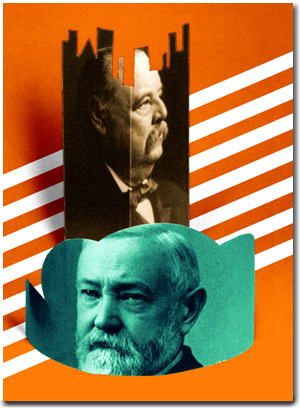 From Grover Cleveland: A Record of Friendship, by Richard Watson Gilder. Originally published by The Century Co. in 1910. This article originally appeared in Issue 25, July/July/August 2008.